A chef must think like a scientist, organize like an accountant, plate up like an artist – and – cook like grandma! 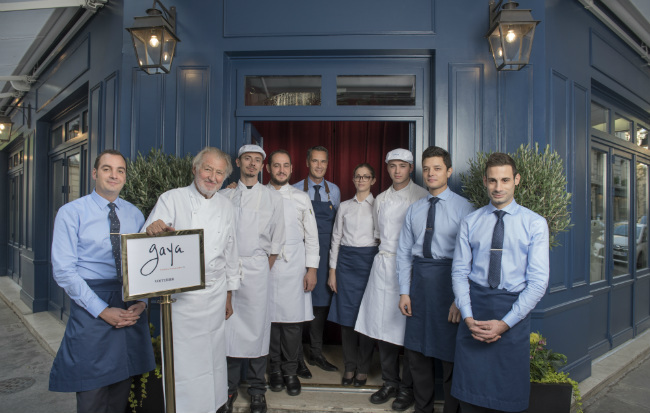 Pierre Gagnaire’s bistrotheque, formerly located on rue du Bac, just moved to rue Saint-Simon and the former La Ferme Saint Simon, once owned by chef Francis Vendenhende and his wife, TV personality, Denise Fabre. Back in the day it was the canteen serving the gratin of ministers and deputies who’d stroll over from the nearby National Assembly. 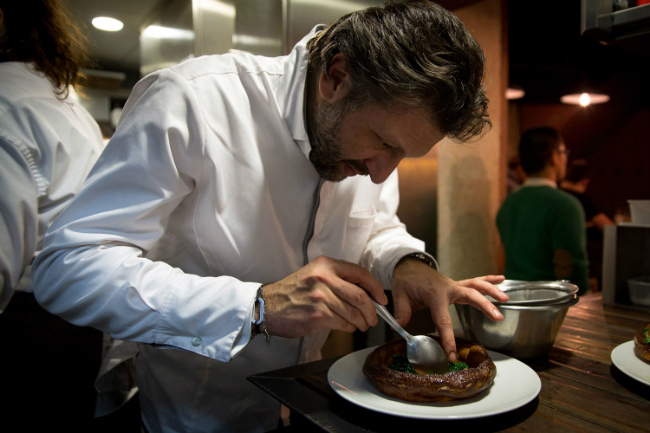 Saying goodbye to the chintzy décor, Marcelo Joulia and Laurent Lelimouzin have given the place a contemporary vibe without detracting from the main event – the food. Walls are punctuated with delightful photos from the chef’s impressive personal collection – it looks as if Gagnaire’s made a good move. 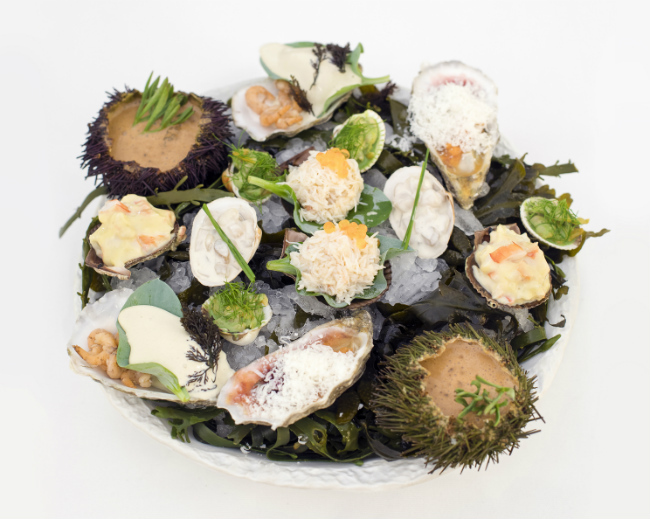 The theme’s “Terre & Mer”. Eat at the bar (for Ministers in a hurry) black croque monsieur (aubergines give it the color), veggie or tuna poke bowls, as well as revisited seafood classics including langoustine mayonnaise, royal sea bream carpaccio, Oeuf Claude Monet, paté Marguerite, Seafood Platter (€85 for 2 people) with matching wines. orange panna-cotta. The impressive wine card is by Frank Lucas, super sommelier and world cup beer champion! So what’s happening at Gaya rue du Bac? It’s re-opening as Piero Trattoria – watch this space! 6 rue Saint-Simon, 7th. Metro: Solferino. Tel: +33 (0)1 45 44 73 73. Closed: Sunday-Monday. Closed 1st January until dinner 4th January, 2019. Lunch formula €39-45. Seafood platter for two €85. 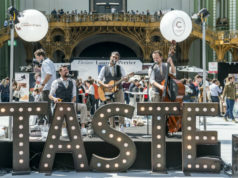 Overlooking Garnier’s Opera House, Café de la Paix has been “the” rendez-vous of le tout Paris since since 1862– a favorite watering hole for the likes of Guy de Maupassant, Oscar Wilde, Emile Zola, Harry Truman, and Josephine Baker. The setting’s romantic: a painted ceiling that’s a listed historic monument, beautiful frescoes, gilded panelling, Corinthian columns. The hotel was used by Robert Altman for his 1994 film Prêt-A-Porter. Outside, the corner terrace is a discreet, Bond style, people-watching observation post. 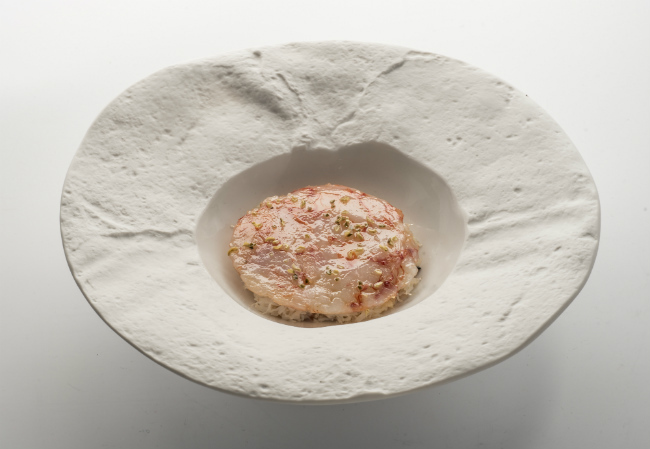 Inside, the menus by Laurent André, Michelin star Executive chef (since 2016), tick all the boxes. 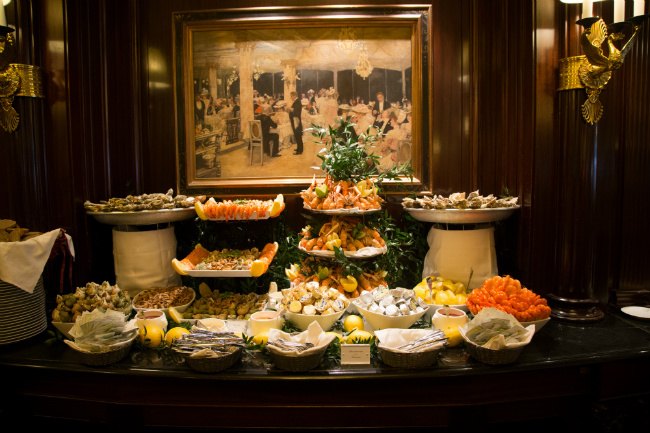 Sunday Brunch, with Oyster Bar, food stations, entertainment for children and music is probably the best in town. And don’t forget to taste cheffe pâtissier Sophie Barnardi’s Opera; the famous dessert was arguably first created for the Opera House around 1890. €94 includes a flute of rosé champagne – 50% for the under 12s and under threes are invited. Reserve Christmas Eve Brunch – 25th December, €115 with a flute of champagne. New Year’s Eve 31st December – multi-course festive dinner (vegetarian options available), €350 includes a flute of champagne. Happy New Year Brunch on 1st January, €145 with champagne. 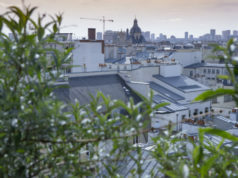 It took four dusty years of construction to build Evok Hotels’ Brach on the corner of rue de la Pompe and rue Jean Richepin in the 16th. The 1970s building formerly housed a Paris postal sorting office (La Poste – the post office – remains). 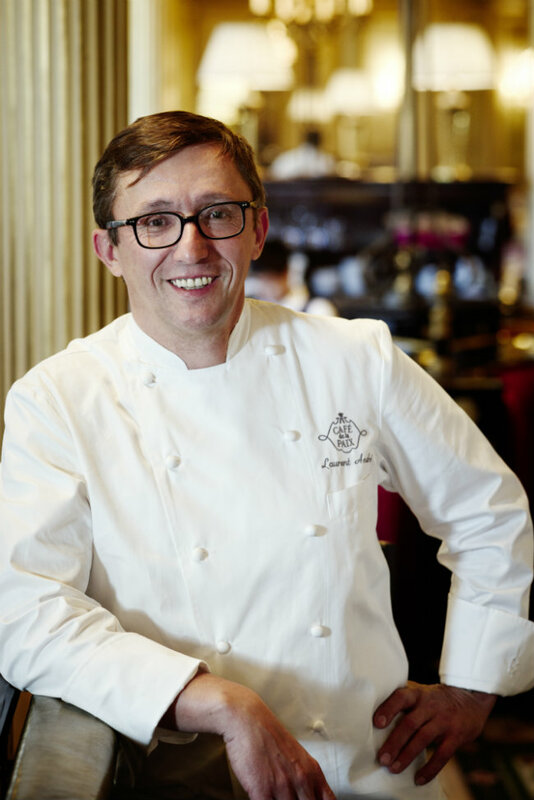 Adam Bentalha heads the slick steel and glass open kitchen; he’s worked in Switzerland at the Royal Savoy, Lausanne and in Paris at the Ritz, Shangri-La, Royal Monceau, Prince des Galles with Stephanie Le Quellec. Order the detox juice (€12) and eat, facing the kitchen, in the achingly stylish lounge featuring squashy sofas, raw wood chairs, cosy corners with walls of books, nick nacks, magazines and sculptures. “We’re serving Sunday brunch from 16th December, it’s going to be fantastic,” promises the chef with the smiling eyes. Bentalha’s food is a Mediterranean fusion style, so you can expect, say, grilled cauliflower, sesame sauce; lobster carpaccio with mussels a la mode turque; Mediterranean tuna, black olive tapenade, marinated tomatoes; couscous quinoa tagine; vitello tonnato, parmesan chips and capers, or onion compôte; truffle ravioli and winter bouillon – the “musts” of the moment. And, save room for spectacular desserts, displayed like precious jewels, by MOF Yann Brys. Launched with huge success in 2012, this restaurant serves neo-traditional, delicious golden, buttery Pascades— flaky, pastry, savory n’ sweet caramelized tarts which originated in the southwest region of Aveyron. 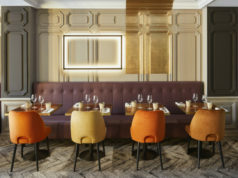 Now rocking a sleek new décor and the input of chef Bruno Doucet from La Régalade Saint-Honoré alongside Sébastien Pradal. 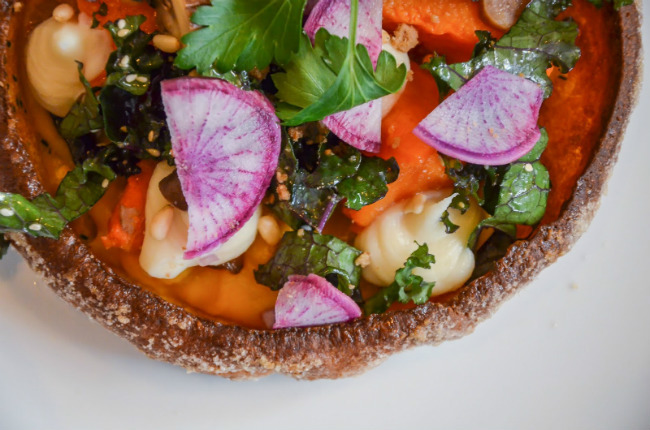 The ideas’s simple – make the Pascade (egg, milk, organic Aveyron flour) then fill with seasonal ingredients. Order with, or if you’re weight watching, without the pastry (€19). The menu starter/main/dessert costs €34. Look for starters of signature Régalade terrine (€10). Beet Hummus with smoked eel, feta, poutargue, eggplant, cashew nuts and cumin (€13) and, for the “ladies who lunch,” a big seasonal salad (€19). For mains we chose butternut squash, mushroom, chestnut and kale Pascade and for the galloping gourmet, scallops, mashed cauliflower, yuzu, brocciu and salad. Share sweet minis for dessert (€18 for 8) and choose from the mostly natural wine chart with bottles by young producers (from €7 a glass) like Côtes de Rhone No Wine’s Land 100% Syrah 2017 from Matthieu Barret (€48). Post lunch the bistro becomes a tea salon, serving mouthwatering sweet, chocolate or seasonal fruit mini-pascades with matching infusions/juices etc. Warning! Pascades can become addictive! Order in – direct from La Pascade – and from www.deliveroo.fr and UberEats. It’s located opposite the historic monument, the Eglise Saint-Cyr-Sainte Julitte, and the municipal theatre, which is why it’s called Show Devant. 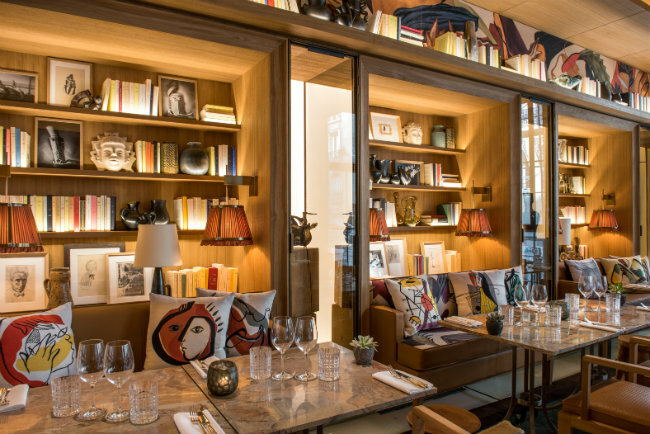 The atmosphere’s as warm as the welcome; you’re chez Olivier in his airy space decorated with flea market finds, wacky art works, bookcases and wine racks. Influences come from time spent in the UK chez Raymond Blanc, from his world travels, and his best friends Michel Roth and Yves Thuries. Acte I: Goat’s cheese cheesecake, drizzled with Villejuif honey, chef uses 20 kilos a year! (€10). Astringent salmon, mango and almond tartare (€12). Crab mille-feuille, parmesan and guacamole (€12.50) with a glass of Domaine Enclos de la Croix (€12). Acte II: If chef was a dish he’d be – Duck Magret served with kalamansi (a small, very round citrus fruit from the Philippines) and potato leaves (€17.50). 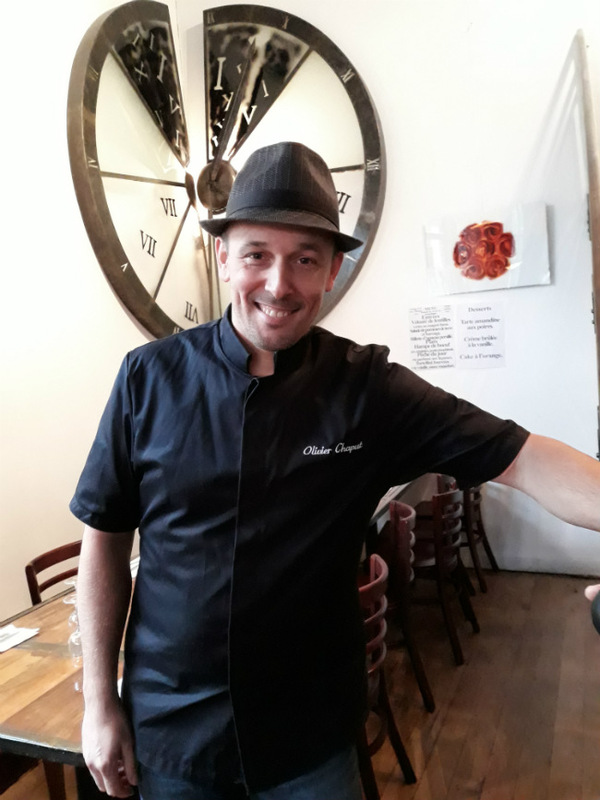 But try slow cooked spicy gigot (leg of lamb) with haricot beans (€19.50); Boudin (sausage) of truffle flavored chicken, pleurotte mushroom risotto (€20.50)– served with Brouilly AOC Château de Corcelles (€5.50/€28). Acte III: Dôme Kalua café, “intrusion” of timut (Nepalese pepper) or a taste of everything with Café de Gourmandises (€8). Menu Bambino invites young gourmets to choose petit portions from the menu (€10.50). There’s a waiting list for New Year’s Eve! 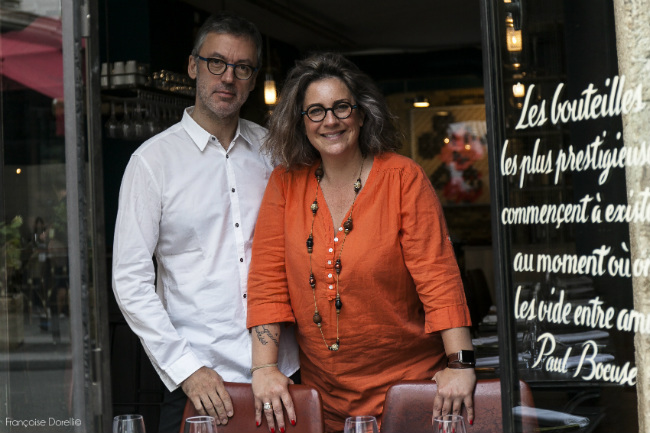 Ring in 2019 with Caroline Savoy and Bruno Blain at their hipster neo-bistrot. Remember Amelie, Jean-Pierre Jeunet’s whimsical 2001 blockbuster film? The Canal St-Martin’s iron footbridges and tree-lined quays formed the backdrop for some of the film’s most atmospheric scenes. Today this ever-gentrifying, fascinating, 19th-century waterway attracts a bobo crowd to the shabby-chic bars and bistros. New Year’s Eve at (V)ivre: the delicious 6-course menu is €75 (without wine pairings) & €110 with wine. Quality/price you can’t do better at home – and no dishes to wash! 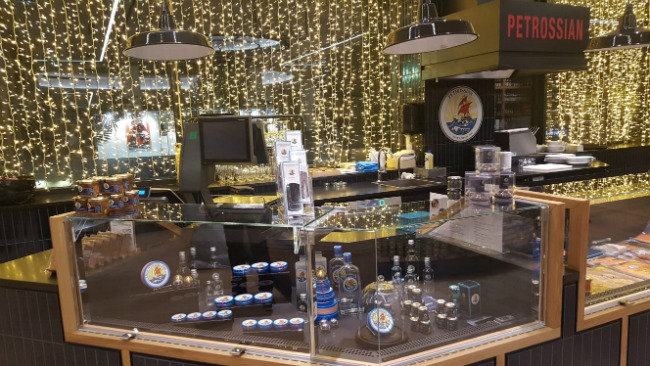 Just in time for Christmas, Petrossian opens a wish-list corner with all your favorite caviars, vodkas, smoked salmon, maviar, blinis, truffles, Russian specialities, chocolates, delicious gift ideas at La Grande Epicerie de Paris Rive Droite in the 16th. Happy holidays! See you on the other side.